I recently learned about a very cool blogging opportunity from my friend Alison Miller. 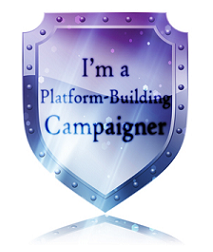 It’s the Writers’ Platform Building Campaign, hosted by Rach Writes. The Campaign is cool way for writers and active bloggers to reach out and network with other like-minded people, thus building our own platforms and helping others to build theirs. If you’re interested in finding out more about this opportunity, visit Platform Building Campaign THIS WEEK for more detailed information. Hello! 🙂 Thanks for stopping by, and looking forward to getting to know you during The Campaign! Thanks! I was excited to see that you’d signed up too! Aw, thanks! Looking forward to getting to know you, Chantele! Me too! Thanks for blogging about it and spreading the word! Hey, I’m in your campaign group! Wanted to stop by and say hi! Hey Katy! Im also in the same Campaigner group as you! Good luck with your book! Thanks! My header always makes me smile… so pretty! Well, I missed the group boat, but I did sign up! Hi Katy! I’m in your YA campaign group. Looking forward to getting to know you! Such a pretty header! Lovely to meet you, fellow campaigner! Hi there. I’m in your YA group. Nice to meet you! Nice to meet you! We’re in the same campaign group 🙂 See ya around. Nice to meet you too, Michelle! Looking forward to getting to know you! Hi Katie! I’m in your campaign group. I already know and love your blog. Looking forward to campaigning with you. Hi, I’m another in the YA campaign group. Nice to meet you! Hello pretty lady! Looks like we’re in the same group – yeah!!! 🙂 Hope you’ve been good! Hi, Katy! Another of the YA group stopping in to say hello. 😉 I do say, I think this is going to be fun. I agree, Holly! Thanks for stopping by! Hello, Katy! Fellow campaigner in the YA group and I’m excited to get to know you! Likewise! Excited for the Campaign to begin! Hi! We’re on the same campaign team. Nice to meet you. I’m so excited and think we’re all going to have a blast. I’m so excited we are in the same group, Katy. I’m sure I’m already following you but I’ll go double check. Have a great day! Me too, Ciara! Looking forward to getting to know you better! Fellow campaigner stopping by! Have a great week. Glad you stopped by, Jennifer! So fun to meet all my fellow campaigners! Likewise, Amanda! Thanks for stopping by!